Balkan food is hearty and filling, full of salads made with seasonal produce, delicious dips, and grilled meat. 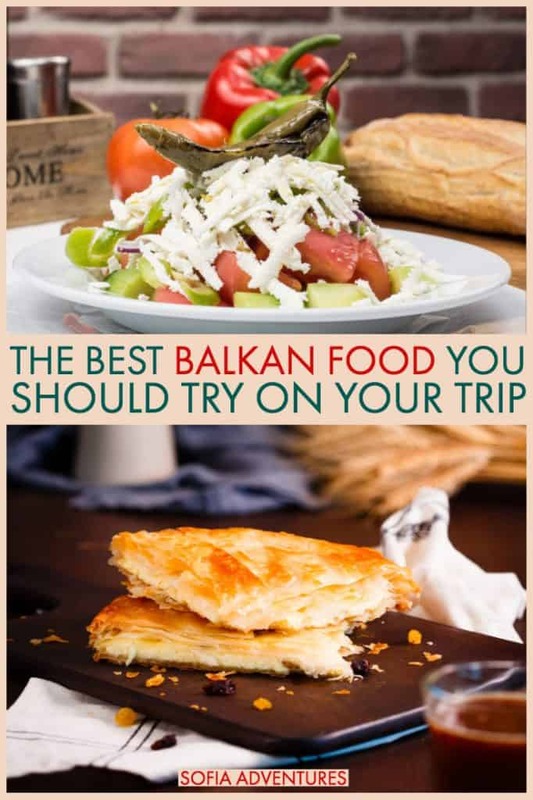 Some foods in the Balkans can be found everywhere — virtually every Balkan country has a variation on borek/burek, and if you can’t find grilled meat anywhere, you’re just not trying — whereas some Balkan food is hard to find outside its specific country of origin. Still, what unites Balkan food is a love of simple food done right, an appreciation for seasonal produce, and of course, how it goes with the national beverage of the Balkans – rakia! My favorite food in the Balkans is and will always be a Shopska Salad. I have had them in nearly every single place in the Balkans, but nothing beats enjoying one in Bulgaria, the place where its origins can be traced. 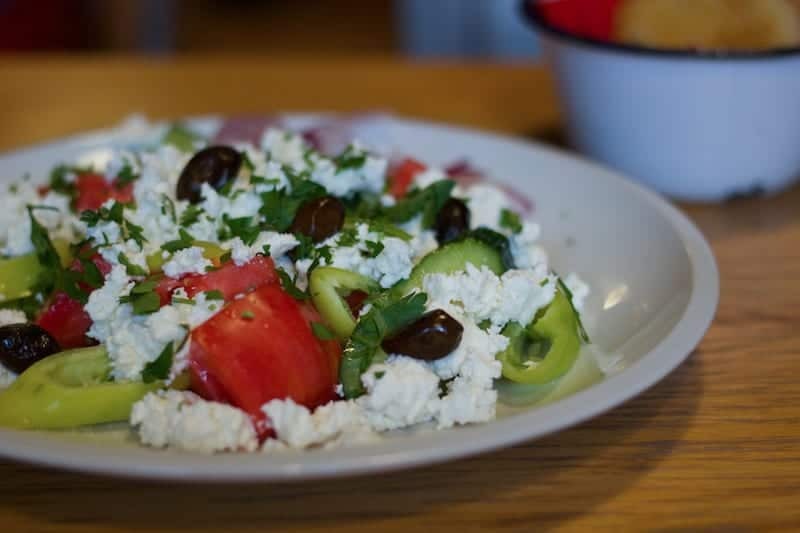 Shopska salads are made from tomatoes, cucumbers, brined cheese, onions (or spring onions), bell peppers, parsley, and sometimes olives. I often purchase these ingredients and make them on my own as the Balkans have sensational produce when in season. While I do love creating them myself, sometimes it is more enjoyable to get one out and about and to be able to taste everyone’s version of it. In Plovdiv, I had a really tasty one at Pavaj in the hip Kapana district of the city. But my absolute favorite place to grab one is at my old local haunt in Sofia called Byufetŭ. This restaurant is unknown amongst tourists, but really has such delicious local dishes, including my favorite Shopska in Sofia! I used to go there regularly while taking a break from my daily coffee dates with my computer as it was right across the street from one of my favorite cafes. Byufetŭ stays open very late, so you can get yourself a fresh Shopska at almost any hour of the day there. We first discovered Slovenian štruklji during an interactive Cook Eat Slovenia cooking class in Ljubljana where we learned how to prepare the popular Slovenian comfort food from scratch. 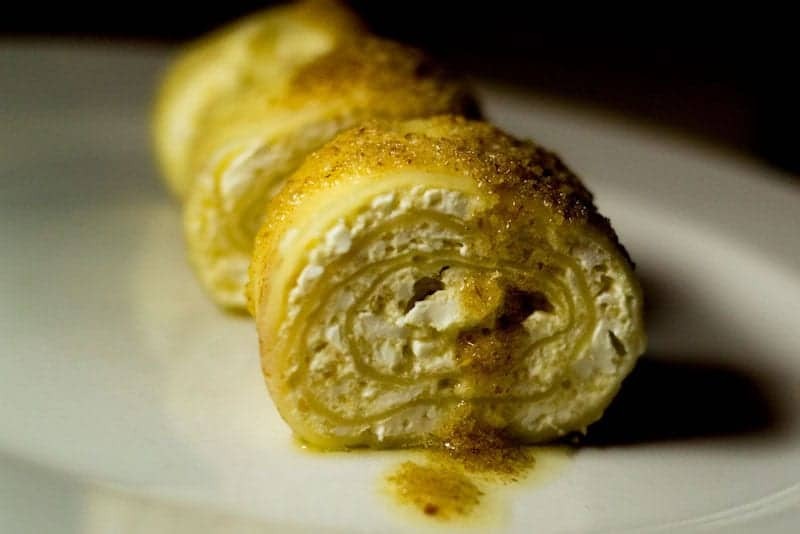 Similar to dumplings, štruklji are rolled pastries that can be prepared either sweet or savory depending on the filling. Typical štruklji fillings include local ingredients like cottage cheese, tarragon, walnuts, and apple. Beyond the filling options, štruklji can either be boiled and luscious (like pasta) or roasted and flaky (like a strudel). We enjoyed many versions of štruklji during our time in Ljubljana but more so than the ones we ate at Moji Štruklji Slovenije. The casual restaurant located near the city’s Central Market takes traditional štruklji to new levels with creative fillings that combine fruits, honey, and even chocolate. 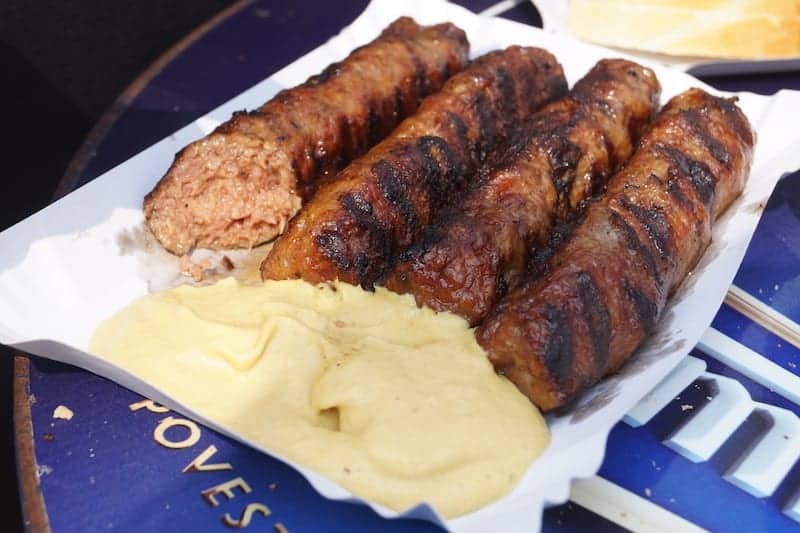 As for traditional flavors, Moji Štruklji Slovenije has them too, as well as soup, sausage, and local craft beer. 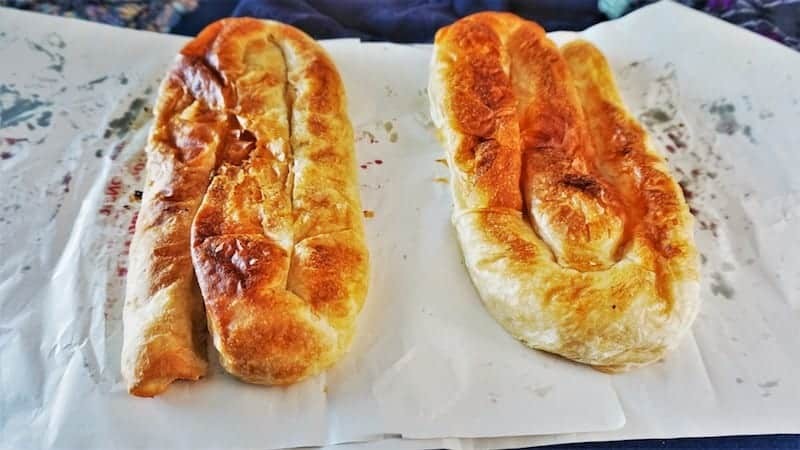 Banitsa (баница) is a traditional Bulgarian dish, favorite of all generations. 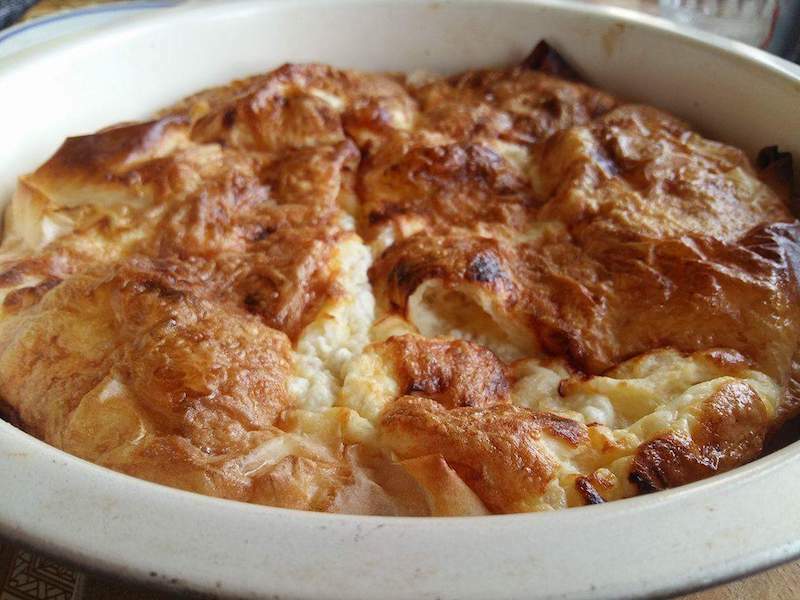 It’s made of whisked eggs and cheese between filo pastry and is perfect in the combination with airyan (айрян) for breakfast or any other time of the day. There are also other varieties of the traditional banitsa, such as banitsa with spinach, banitsa with pumpkin, etc. We Bulgarians are very proud of our delicious cuisine and I also believe that the food is one of the great reasons to visit Bulgaria. I always miss banitsa and other traditional Bulgarian dishes while I’m traveling. My mom recently told me about this banicharnitsa (баничарница, a place where they sell banitsa) on Lion’s Bridge – НИ – КАЙ – and I’m loving it! Mussels saganaki is easily one of the tastiest Greek seafood dishes. It consists of fresh mussels sautéed together with tomatoes, peppers, herbs, red wine and feta cheese creating rich, savory sauce. The sauce is actually the star of the meal and the best part comes when all the mussels are gone. This is the time to break some fresh, crusty bread and dip it into the flavourful sauce until the plate is perfectly clean. The name “saganaki” doesn’t actually refer to the ingredients of this dish but to the pan used for its preparation. Saganaki is a small, traditional, two-handled pan used in a variety of Greek recipes. The most common is cheese saganaki (pan-fried cheese), often just simply named saganaki on the menu, so don’t get confused. It wouldn’t be such a horrible mistake, though, as it is pretty delicious, too. 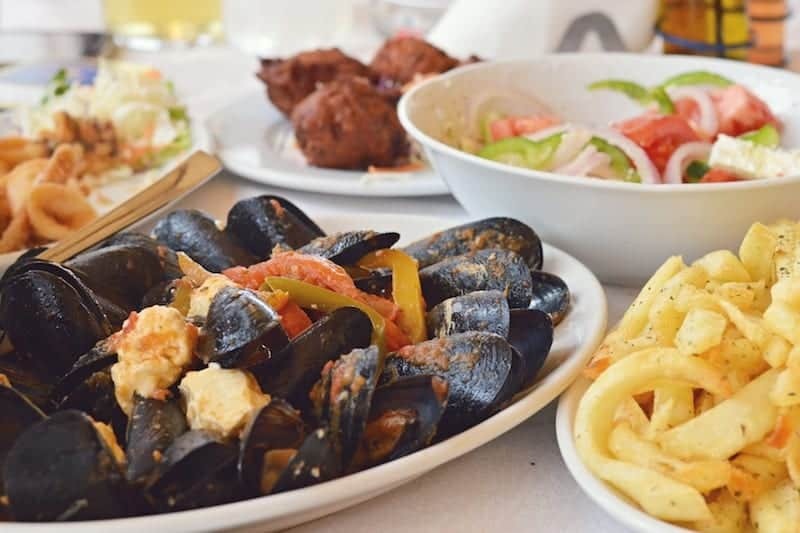 Mussels saganaki can be found in any good fish tavern (Psarotaverna) across Greece. However, I keep returning to the fish taverns at Lavrio, an industrial port on the western shore of Attica, for this dish and others. The town is not particularly pretty, but their seafood is delicious and absolutely worth the hour-long drive from Athens. 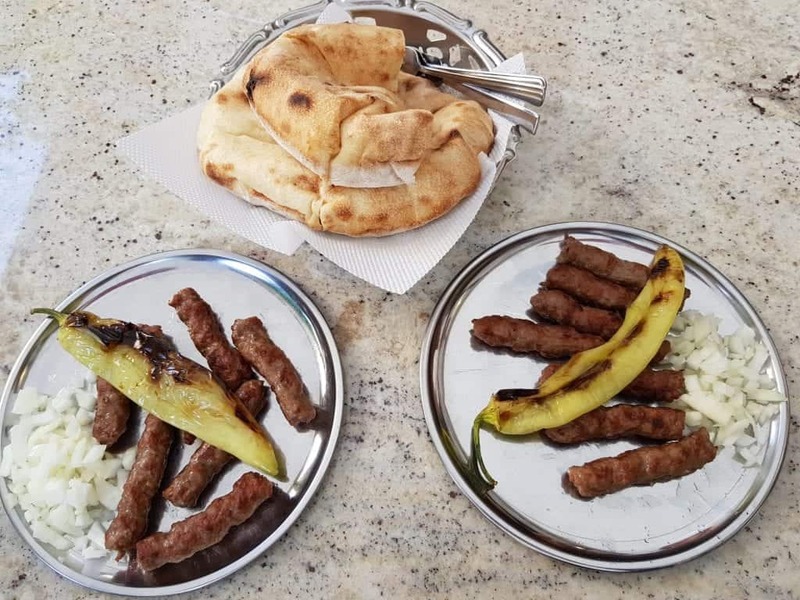 Çig köfte isn’t the first dish that I fell in love with when I lived in Turkey, but now that I’ve left Turkey, there are few foods that I crave more. It’s a staple in the nation, and the now primarily vegetarian delight descended from a raw meat dish that is now not as easily found. Çig Köfte is essentially a bulgur wheat base with capsicum paste, and healthy portions of onion, garlic, pepper, paprika, and garlic. What’s unique about it is that in Turkey it’s served in small balls that are often the shape of the inside of a fist. That’s largely because they’re handmade, and those who can make it well are seriously revered. If the dish wasn’t unique enough, it’s often served with lettuce and a touch of mint. 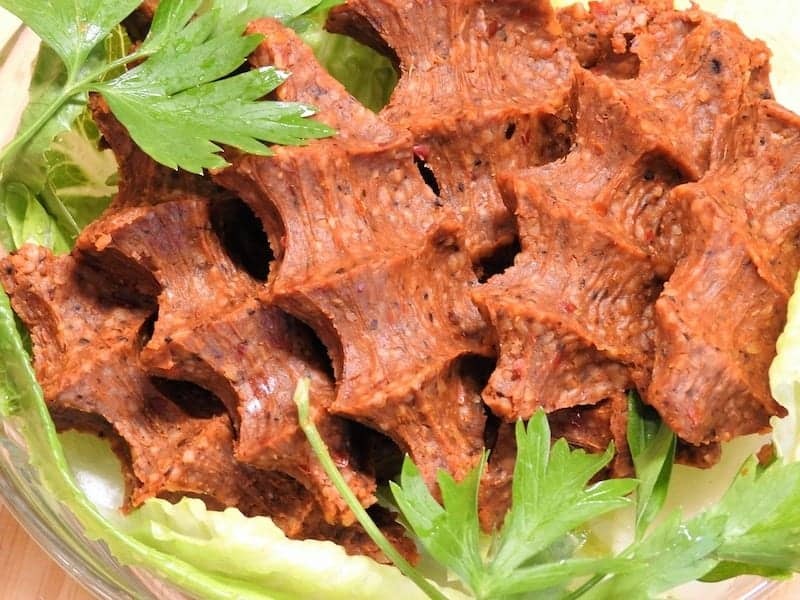 You actually take the çig köfte “paste” and place it inside of a lettuce wrap which can be served with a thick pomegranate sauce. Really, it’s one of those things that you need to get to Turkey and try for yourself. No description will do it justice and, in my opinion, it’s actually an acquired taste, but it’s a taste well worth acquiring. Mekitsa is a traditional sweet Bulgarian breakfast dish. It is one of those comfort foods that Grandma made when you were a kid, rather than a food that could be bought in a cafe or restaurant. Recently, a little store called Mekitsa & Kafe has opened up in Sofia selling these delicious little morsels, and I was able to have a taste on a food tour. The recipe used here is one that was found after a nationwide search for the best mekitsa, in an effort to stop this traditional food from fading into history. These tasty treats are a little like puffy pancakes or even doughnuts in flavour, but with a crispy outer shell. 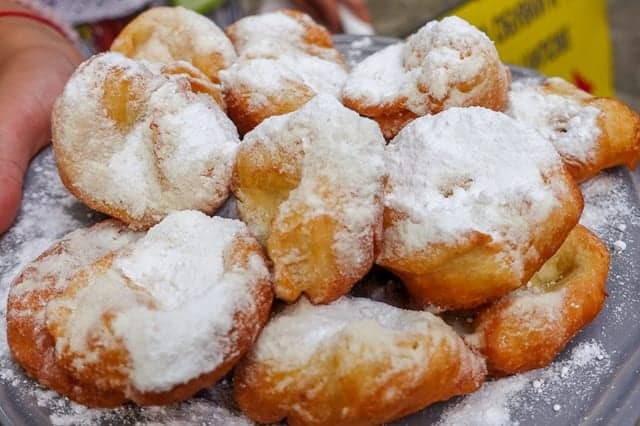 They are made out of a batter including Bulgaria’s favorite ingredient – yogurt! The locals usually eat them smeared with honey or Nutella or jam. We got to try a smaller version covered only in powdered sugar, and they were so delicious just like that I’m not sure I’d want to add the extra flavors. It’s well worth hunting Mekitsa & Kafe down when in Sofia to try these this traditional breakfast – even if it’s the middle of the afternoon! A trip to the Balkans is definitely not complete without sampling burek (in at least 20 different varieties). While your arteries may not be such a fan, your stomach will be delighted by this filled pastry goodness that is traditional Balkan food. It comes in all forms from rolls to pies to triangles and is usually filled with meat, cheese, or spinach. A piece of burek will set you back about 50 cents making it every budget traveler’s best friend. We sampled burek from most Balkan countries but the stuff we found in small-town Albania topped the lot. Crunchy, flaky pastry filled with fresh spinach and cheese served piping hot for a matter of cents. Everything we needed for a road trip pitstop snack! Our favorite shape was the tubes snaked around itself. Fun fact: In 2017 the world’s biggest burek was made, weighing in at 650 kilos! Kebapi is a traditional dish in Macedonia and is often eaten with sides of onions and bell peppers. It is minced beef normally made into a long fillet and grilled. Kebapi is normally eaten with freshly baked flatbread. Very similar to kebabs, kebapi was the first dish we had as we landed at Skopje. We were staying by the Marriott in Skopje, and a lot of restaurants were just a few minutes walk away. We walked to one of the restaurants along the streets and ordered this dish. I had no idea how similar the dish was to the Turkish/Arabic cuisine. We absolutely enjoyed the bread as well as the kebapis. If there is one thing that will keep sticking in your head after a trip to Romania, it’s definitely the smell of grilled mici. This delicious and meaty food can be found everywhere: as a starter or main in restaurants, at little kiosks or weekly markets, where it not only fill the stomachs of busy street vendors, but also of those who love shopping. Translated from Romanian, mititei or mici (which basically describe the same dish) means “small ones” in English and this is what they are: grilled ground meat rolls made from a mixture of beef, lamb, and pork and topped with spices such as garlic, black pepper, coriander, thyme, anise, and paprika. It resembles cevapi or even the Turkish kefta. You can enjoy miti plain, or eat it with french fries, mustard and muraturi, which are Romanian pickles. In any case, fluffy white Romanian bread will also do the job very well! If you’re looking for traditional Romanian cuisine when visiting Bucharest, look no further than the capital’s oldest inn, Hanul Lui Manuc, in the heart of the city center. Built by a wealthy Armenian in 1808, the inn has evolved over time and today houses a restaurant in the inner courtyard. Walk through the arched gateway and have a seat in the historical courtyard and enjoy a meal while admiring the architecture of the inn. 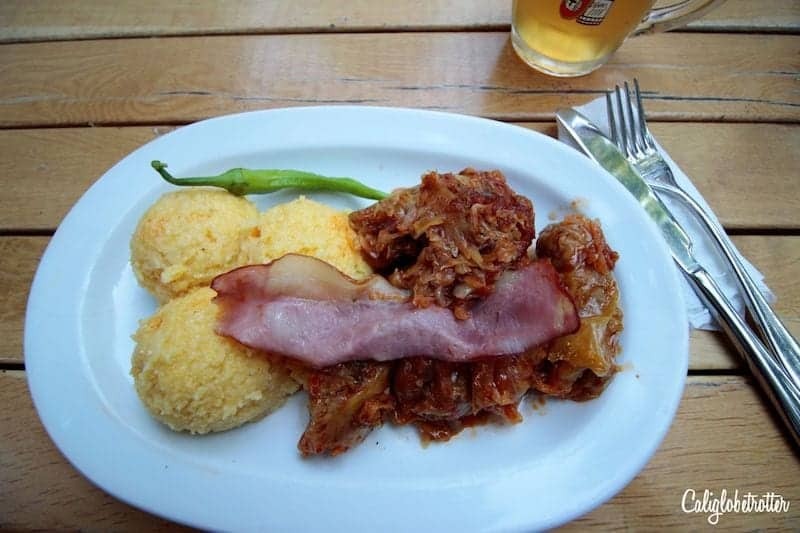 Romanian Cabbage Rolls (Sarmale) with a side of polenta (Mamaliga) is considered to be the national dish of Romania based on a Turkish dish which reflects the influence of the Ottoman Empire not just in Romania but throughout the Balkans and Eastern Europe. The cabbage leaves are stuffed with pork and beef and are then rolled up, baked, simmered or steamed and accompanied with a sauce and with a slice of bacon to top it off. Wash it down with a traditional Romanian house beer! 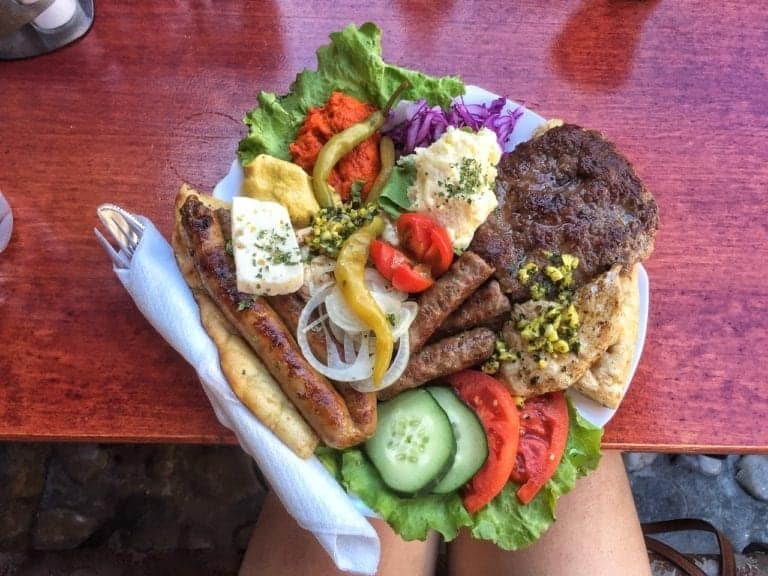 It was quite possibly my favorite meal while honeymooning through the Balkans! 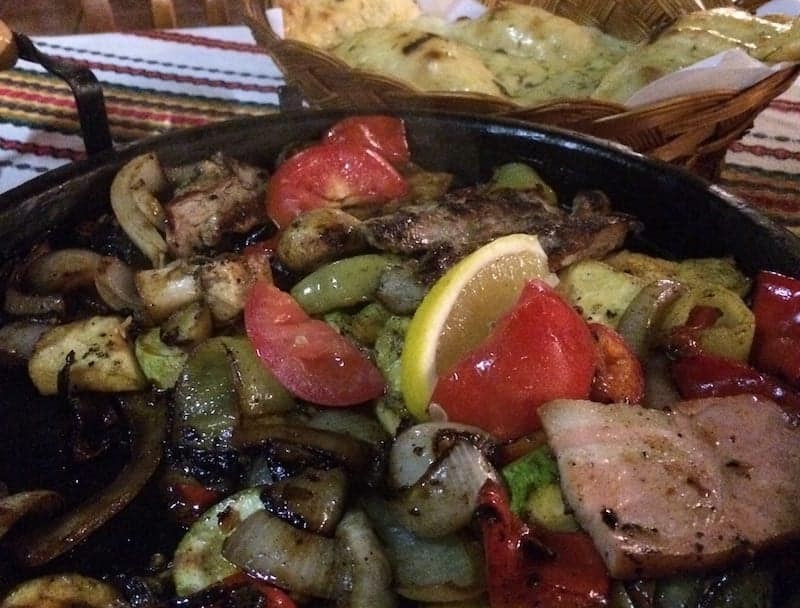 If you’re looking for some serious Bulgarian food to comfort you then look no further than the Bulgarian Sach. It’s usually a meat-based dish, although you can find vegetarian versions of this. The sach is served on a hot stone or hot iron plate, still sizzling and cooking away. You’ll find chunks of your favorite meats – the usuals are chicken, pork and here in Bansko, our favorite is the spicy sausage. There are also heaps of onions, peppers, and potatoes cooking alongside the meat. Usually served as a minimum for 2 people, this is entertainment and eating at the same time. It’s served family style, steaming hot food that’s prepared with seriously fresh ingredients. My favorite place to eat a sach is at the Log House in Bansko, on the back terrace looking out into the mountains. In summer I’ll wash it down with an ice cold grapefruit Radler beer and in winter their jug of house red wine is the perfect accompaniment. Planning a Trip to the Balkans? Don’t Forget Travel Insurance! Make sure you always travel to the Balkans with a valid travel insurance policy. Travel here includes outdoor activities and travel to highly touristed sites. You need to be covered in case you have an accident or fall victim to theft. Travel insurance will help you recover your expenses and continue to enjoy your trip. 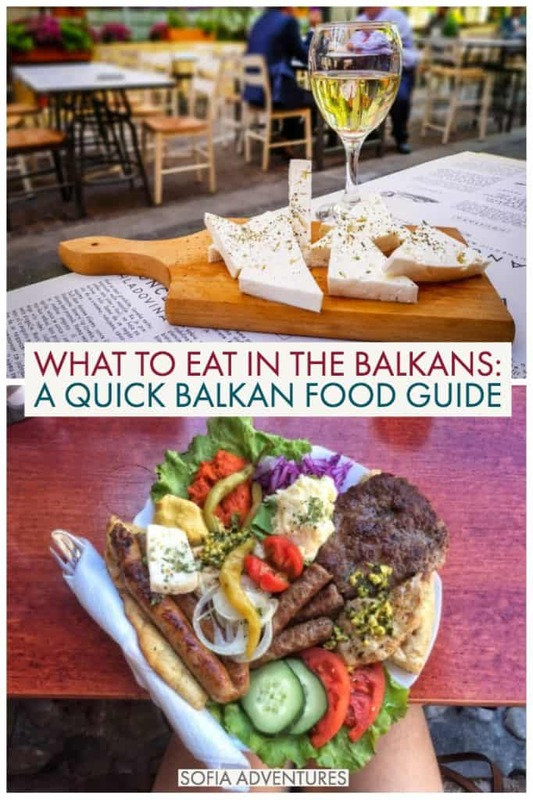 If you’re planning a trip to the Balkans, we have a lot of resources to help you! We have a guide on how to best use this Balkan blog to help you plan your trip. We have posts about the different Balkan currencies, the best beaches in the Balkans, planning a Balkan road trip, and Balkan itinerary planning ideas, among other ideas. We have pages for each country, so you can navigate through our site and find the specific countries you need here! Thanks so much for letting me share the stuffed cabbage with you and your readers!